Built in 1907 and converted to a theatre in the mid 1940s, The Players Theatre has been a jewel in the heart of Greenwich Village, serving as a magnet for performing artists and their audiences. The Players Theatre is home to the famous Café Wha? which has been a Greenwich Village mainstay since the 1960s. One of the Village's original and most famous rock clubs, it was the regular hang out for Allen Ginsberg, Abbie Hoffman, and Bob Dylan, Jimi Hendrix, Bruce Springsteen and many other performers. 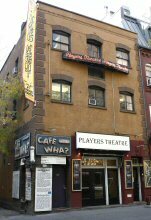 The Players Theatre is where Quentin Crisp performed An Evening with Quentin Crisp for the first time in New York City. Opening night was on December 20, 1978; closing performance was March 4, 1979. Mr. Crisp provided 81 performances during the show's run and received New York's 1979 Drama Desk Award for Outstanding Unique Theatrical Experience. 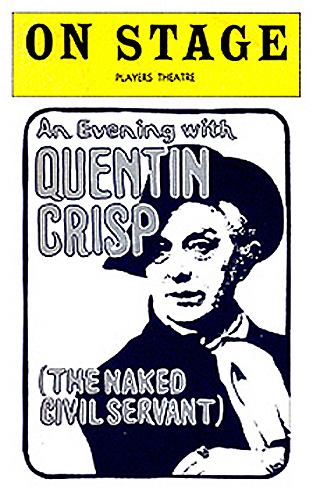 Quentin Crisp's first appearance in America was a two-week run of his show at the Long Wharf Theatre, Stage II, debuting on October 31, 1978. Program cover from Mr. Crisp's performance at The Players Theatre. Photograph © by Carol Rosegg. All rights reserved. Site Copyright © 19992012 by the Quentin Crisp Archives.